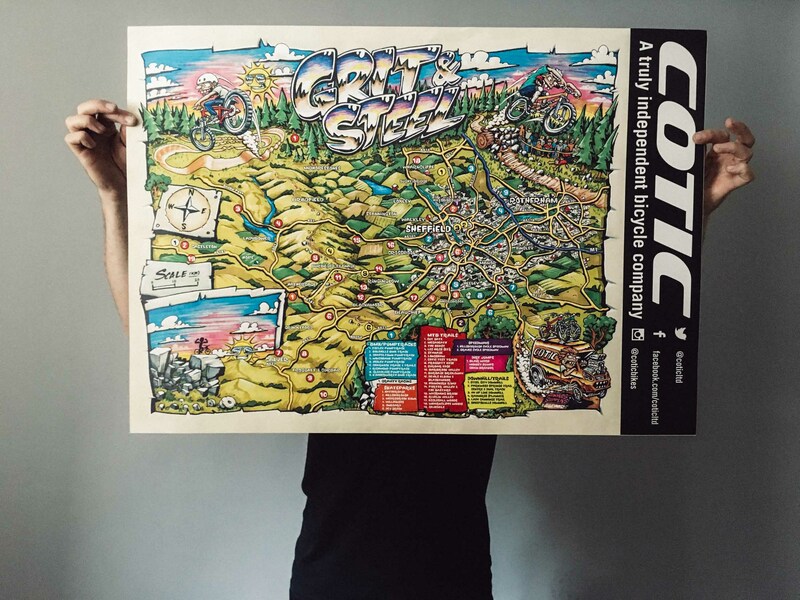 Cotic Grit and Steel Sheffield Riding Map Now a Poster! You might have seen earlier in the year that we commissioned a bespoke piece of art. We put a lot into our local scene, with our annual 0.5% of sales Trail Fund, as well as volunteering with Ride Sheffield. We love our City and our region, and we wanted to pay tribute to it. Our bikes are all about great design, so we had to put the same effort into any artwork we were going to commission and we loved the result. It was the Grit and Steel Map. It lists all the amazing riding areas near us, and is something just plain cool to hang on the wall. We even did a bit of an art launch and exhibition for it. Get us!